Amare Stoudemire is considered one of the best big men in the game, but his lack of focus has been roundly criticized for most of his career. Once in a while though, he silences the critics. Even though his defense is sorely lacking at times, he can make up for it with an amazing ability to dominate a game on the offensive end. Last night was one of those nights. 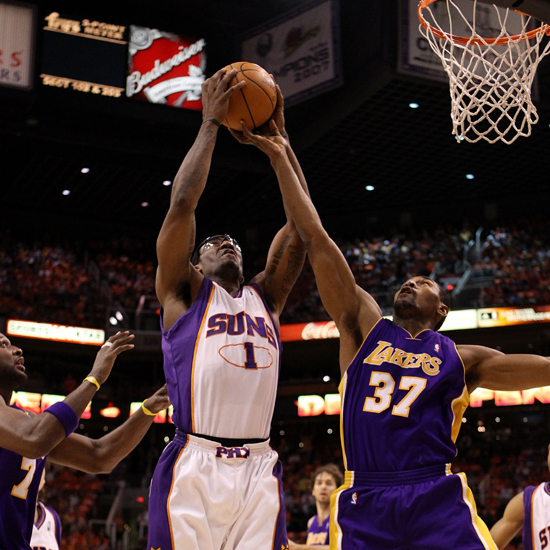 With Phoenix in a 2-0 hole in the Western Conference Finals against the Lakers, Sunday’s game was do or die. Amare chose do. He scored 42 points, going 14-22 from the field. He also got to the line 18 times, converting on 14 of them. His ability to get to the basket for easy shots frustrated the Laker big men. At one point in the first quarter, they had sent him to the line on 4 of the first 9 possessions. He also added 11 rebounds in the effort. The Suns are now down 2 games to 1, but a win in game 4 could tie up the series at 2-2 and make the whole series up for grabs. While Boston will be waiting in the East, it looks like the Lakers path to a ring may get a bit hairy. Kobe is at the peak of his game, but when Amare, Nash and the Suns are firing on all cylinders like they did last night, it opens the door for a possible Suns Western Conference Championship. For now, Amare wins the “Stat Line of the Night”.